We recently hosted a Paw Patrol birthday for my daughters third birthday. We wanted to have a nice toddler-friendly birthday party with activities and other ideas suitable for pre-school children. Since we knew we will have lots of guests (12 kids, ages ranging from 1 to 3 plus adults) we knew we wanted to keep it simple and easy. 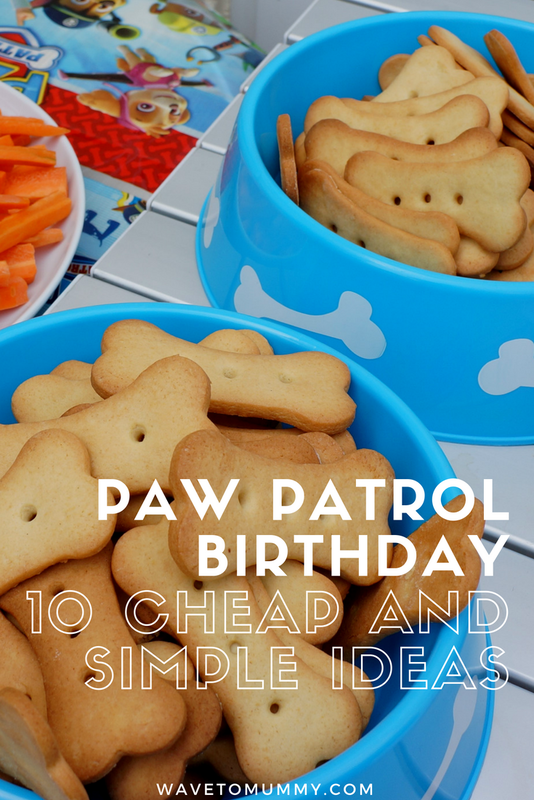 Here are ten of the simple but fun ideas we used for our Paw Patrol birthday. Like so many kids at the moment, out daughter has gone nuts about Paw Patrol. Everything is Paw Patrol now, even our family. I am Sky and her daddy is Chase - she herself is Everest. So it was no surprise when I asked her what kind of party she would like to have. It was fun to come up with ideas for the party. 1. Paw Patrol branded decoration. You can buy these from many different suppliers like from Party Pieces. We had cups, plates and napkins, as well as a table cloth and some "Happy Birthday" bunting. Granted, these won't make your party look a stylishly Pinterest-worthy, but kids loved them! 2. Doggy bowls. As part of the decorations these work a treat. You can get cheap doggy bowls from pound shops (which is where we got ours) and they are perfect to serve snacks in. I matched these to the Paw Patrol colours by choosing sky blue! 3. Labelling snacks. You can make pretty much anything sound more Paw Patrol like with some clever labelling strategies... How about some Pup-corn? Or Paw-peroni pizza? We also had some Paw-tilla chips and Huu-mus, not sure if those names really worked that well but hey, sort of! 4. Main course: hot dogs! We wanted to keep things simple so we only had one main course, and hot dogs fit the theme paw-fectly. We had a hot dog station, with the frankfurters on a pan in hot water, and buns and condiments next to them. People could pop by and make their own whenever they wanted to so it was minimal hassle for us. 5. Dessert: doggy biscuits! I made them using this recipe by Nigella - this dough retains its shape well. I got bone shaped cookie cutters from Ebay, and I used a straw to make three holes in the middle. These look exactly like the "Honey biscuits" the pups get given in Paw Patrol, and kids LOVED them. For a cake, an easy way to decorate is to create a "Malteser" slide and stick a Rubble figurine on top. A good tutorial on how to do one is here. 6. Modelling balloons for entertainment. In case the kids needed some entertainment, I got modelling balloons. It is so simple to make a balloon puppy, and fits the theme great. 7. Paw Patrol stickers and party hats for an activity. Pre-schoolers love stickers, and having them decorate their party hats with some Paw Patrol stickers is a fun little activity for them. We got Paw Patrol stickers from the pound shop so this was a very low-cost option. 8. Paw Patrol costume. For the birthday girl or boy, a Paw Patrol costume is a great idea. We got one of these. Word of warning though, the sizing on the ones we got is weird and is very wide. On our three year old the smaller size (1-2years old) fit better, but the hat was too small. With the bigger size (3-4years old) the hat would have been right size but the costume humongous. The fabric is pretty cheap too, and the Skye outfit discards glitter everywhere... Anyway, she loved her costume which was the main thing! 9. Paw Patrol toys as a decoration and to play with. If you are hosting a Paw Patrol birthday party, I'd say it is pretty likely you already have some puptastic merchandise in your house... We brought all her Paw Patrol themed toys to the living room for kids to play with. Alternative ideas are to make your own dog house out of cardboard - we didn't have time unfortunately but I think this is a fabulous idea. We did consider buying a cheap Paw Patrol themed play tent for kids to play in, but decided against it in the end as we already have a lot of toys. 10. As a party favour we gave out Paw Patrol magazines. These are great for kids aged between 2 and 5 and is such a great idea for a time-poor parent as all you need to do is pop by a supermarket and get a few copies. The magazines have stickers, stories, activities, and colouring pages, and of course a toy! Occasionally there is also something extra, like a poster or a sticker book. We have bought a few of these magazines for our daughter as the toys are always good quality and sturdy enough to last a long time, even with a threenager. This is such an easy way to do a party favour for a birthday! The kids absolutely loved these and were in awe when they got their hands on one. For baby guests we got an alternative baby-friendly party bag. I drew paw prints on plain paper bags, and filled the bags with soap bubbles, and a soft toy puppy. These were also from pound shop so didn't break a bank. The Paw Patrol party we hosted went great. We had loads of guests and everyone had fun, especially the smallest pups. You don't need to blow your budget on a themed party - you can easily do much of the decorations yourself, and with some smart shopping the rest won't cost a bomb. 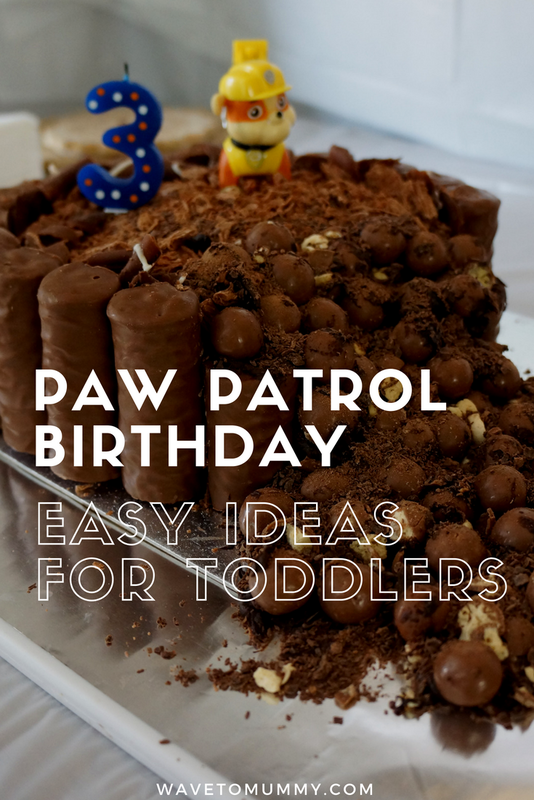 Do you have any other good ideas for a Paw Patrol party?